There are many Western sources that are the basis of evidence that may surprise many researchers. Both Armenian scholars, Turkish scholars, and Western scholars have used these sources to present a certain viewpoint or conclusion. However, perhaps if one were to read the sources themselves they would be able to draw a more accurate conclusion of their own. It is important to note that no matter what the perspective, many political positions on the Armenian Genocide Debate do involve archival material and thus no political position should be persecuted because each side's research is significant and substantial. Germany an ally of the Ottomans during World War I as the leading nation of the Central Powers, had many communications between diplomats and took meticulous archives of the events that occurred in Ottoman Turkey and they had the most access of any European power. The British archives (www.nationalarchives.gov.uk), are mostly made up of communications and information submitted by British Foreign Office employees and diplomats. Many of the documents in U.S. archives seem to be telegrams, usually involving Henry Morganthau and sometimes Morganthau's memoirs are referenced. Armenians at [Der-el] Zor are fairly satisfied; they have already settled down to business and are earning their livings." Among Armenian sources are the Armenian Patriarchate and Armenian scholars, professors, historians, government officials, and authors. Armenian National Archives have been locked for years, the Armenian government has been called to open their archives multiple times by the Turkish government and historical organizations. Notwithstanding the large number of victims of massacres and deporations, most of the Armenians have been able to escape or survive extermination. Pasdermadjian in his book states: 2,100,000. This area has archival material of a variety of European and non-European nations that are not large enough to include in other sections. 1912-1913 - An Armenian, Marcel Leart states the Armenian population in Ottoman Turkey as 1,018,000 in all Turkish provinces of Erzurum, Van, Bitlis, Harput, Diyarbekir, Sivas. Marcel Leart's real name was Krikor Zohrap. 1913 - Ludovic de Constenson states that the Armenian population in the world is 3,100,000; in Turkey as 1,400,000; in Russia 1,550,000. 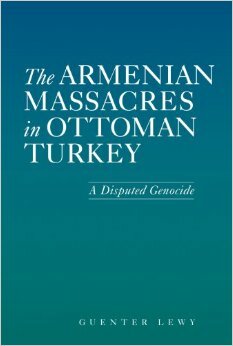 Lynch states in his book that the Armenian population in the Ottoman Empire was 1,325,246. Viconte de Coursons wrote in his book that he used Cuinet's figures. Alexander Powell explains that the Armenian population in Turkey was 1,500,000. Christopher Walker states the Armenian population in Turkey was between 1,500,000-2,000,000. Clair Price reports that prior to World War I there were 1,000,000 Armenians in Turkey. 1910 edition of Encyclopaedia Britannica states the Armenian population in Turkey: 1,500,000. The article was written by a British author. 1953 edition of Encyclopaedia Britannica states the Armenian population in Turkey: 2,500,550. The article was written by an Armenian author. Ottoman-Turkish Archives are accessible today in Istanbul, Turkey. They have been open beginning in the 1980s but many archives were not cataloged in the initial opening. Today, most of what relates to the Armenian Genocide allegations have been uncovered and new research has changed historians' beliefs about the alleged Armenian Genocide.